PRESS RELEASE: Focusrite's latest innovation is VRM Box, a headphone monitoring system featuring the patent-pending VRM (Virtual Reference Monitoring) technology. 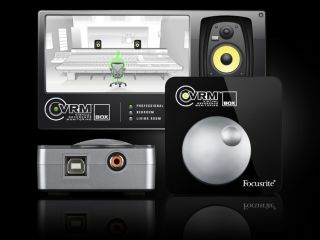 With VRM Box, you can mix in your studio, wherever you are. VRM Box functions as a high-quality 24-bit/48kHz USB audio playback interface. So, whether you're mixing, creating music or simply listening to tracks, VRM Box is perfect.What's more, there's no need for a power supply or batteries, because it gets all the power it needs, with full audio quality, from your computer's USB port. VRM Box also features a digital (S/PDIF) input, which supports sample rates up to 192kHz. This allows you to run it in conjunction with your Pro Tools HD system, or any other interface with an S/PDIF output. With VRM Box, you can mix any time, anywhere, using any monitoring headphones. The accompanying software lets you choose your mixing environment and the virtual speakers you wish to monitor on, then processes the audio before feeding it in real time to the hardware. Built into VRM technology are precise models of a variety of industrystandard studio monitors, including the Genelec 1031A, KRKs VXT8, the Auratone 5C and the ubiquitous Yamaha NS10M. There are also models of speakers commonly found in domestic environments, so you can check your mixes on a variety of virtual systems. VRM processing can be bypassed; an LED on the hardware illuminates when it's active. VRM Box delivers audio quality worthy of your headphones. Boasting a dynamic range of 108dB, its headphone amplifier provides a sound that's more precise, with lower distortion, than other low-cost audio interfaces, and far superior to built-in laptop headphone outputs. A slick volume dial gives you accurate control over the output level. VRM overcomes the major obstacles of mixing with headphones by giving you spatial cues to make informed mix decisions, and by providing multiple perspectives on your mix: just like with speakers. VRM also surmounts various practical issues, such as mixing at unsociable hours and in mobile situations. Virtual Reference Monitoring (VRM) lets you audition your mix in different environments, through different speakers, just using headphones. It gets all the power it needs - with full audio quality guaranteed - from your computer's USB port. Whether you're mixing, creating music or simply listening to tracks, VRM Box is the perfect playback interface for your digital audio software. With a dynamic range of 108dB (A-weighted), VRM Box provides a significant audio upgrade from low-grade laptop headphone outputs (which commonly only provide around 92 or 93dB), with an audio quality the equal of interfaces ten times its price. The VRM Box software application provides total control over speaker and room selection, with an attractive GUI that also features a bypass mode. VRM models are processed by the software on the host computer. VRM Box features an S/PDIF input that supports sampling rates up to 192kHz, allowing you to use it with any DAW system with S/PDIF connectivity, including Pro Tools HD. VRM Box hardware is built to a high specification. Featuring a high-gloss top surface, with VRM status LED and slick volume dial, it makes an attractive addition to your desktop, but is also durable enough for life on the road. Operational note: In order for VRM processing to operate, a USB connection to a computer running the included VRM Box software is permanently required, even when using the S/PDIF input.